I ended up having to rebuild the entire bottom of the table (legs and apron) because the old legs (and their hardware) were just too unstable. On the upside, I got to make them a whole lot prettier. Can you guess what the legs are made of? Yes, I bought balusters from Lowe’s and cut them down to size. I love these legs with a love that is deep and abiding and kind of obsessive. Well, Passover was disastrous to my waistline, but the past two weeks have brought it back under control. I haven’t been eating wonderfully, but it’s not terrible. My real challenge is getting exercise. I’ve been so tired lately that napping has been a priority. I’d like to be biking more, but biking K to school means devoting an hour and a half of my day, and I’m just not able to do it most of the time. I’m committed to finding a way, though. I have to. In the meantime, I’ve found a shortcut to some instant (albeit small) weight loss. I chopped off the bottom ten inches of my hair. That’s half a pound gone. Only forty more pounds to go. Just as I’m posting the photo now, I realize that the flowers have polka dots in their middles. 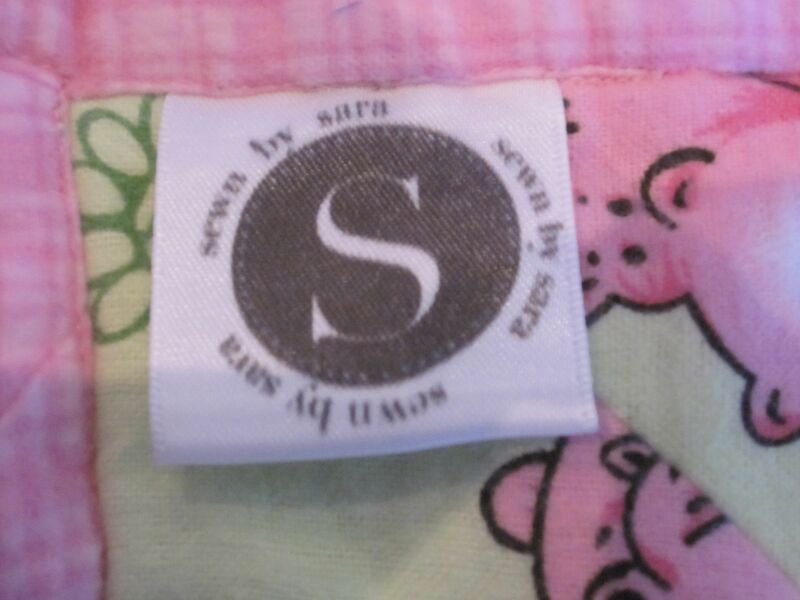 I think I’ll use a polka-dotted fabric (white on pink, maybe?) to make a sash and other contrasting trims. The top will be made out of old white t-shirts that we got rid of in the great closet purge of ’12. I’m using a combination of tutorials from Make it and Love it, possibly the best online resource for those of us who want to sew stuff NOW, regardless of our lack of actual sewing knowledge. I know I’ve done my workshop before, but it’s a mess again. I want it organized and pleasant so that I can go down there to do all my work – the blogging, the sewing, the woodworking – without being accosted from every angle by sticky hands and insistent voices that this! is the best! tiger! ever! and I have to tell you why! I’m also thinking of upgrading my work surface a bit (possibly just by fitting a wooden worktop into the corner against the wall) so that I have a nice large table for cutting fabrics, and possibly even for ironing larger things. The freestanding ironing board that’s currently taking up space is just a bit less than ideal, I think. So that’s it. Of course, that’s never really it. I still need to work on the photo book I started. And I want to get the garden cleaned up. And the car needs new all-season tires, and in any event it needs the snow tires swapped out, and we should check out what that screeching noise is that it makes when I start the engine. Oh, and we have houseguests coming on Wednesday, so we need to tidy up the playroom and turn it into the guest room. Good thing I’ve recently taken up drinking coffee. Looks like I’ll be needing it. We’re getting so tired of the usual meals. Mr. December is agitating for an “experimental” dinner once a week (I talked him down to biweekly.) I’m feeling stuck because I’ve been trying to do more vegetarian stuff, but often meat is just so much easier (and quicker,) not to mention the fact that a plain piece of grilled meat is about as Weight-Watchers friendly as it gets. What’s the issue? If you’ve ever bought kosher meat (and inwardly compared it to the price of non-kosher meat) you’d understand. If you never have, let me just say: double price, if not more. But I’ve been instructed by Mr. December not to worry about that while I’m trying so hard to lose weight, so our meal plans might be a bit more meat-heavy for a while. Hm. Not too bad, plenty of things we haven’t had in a while. What haven’t you made in a while (that you really love)? What are you eating this week? Still not sure what you’re making for dinner? Get inspired by the other posters at Organizing Junkie’s Menu Plan Monday. Alas, another week has gone by without the time to post. 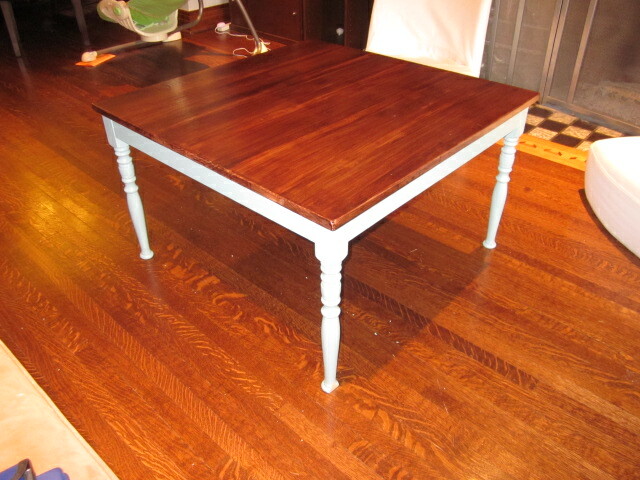 I rebuilt my table for greater stability (and prettier legs,) then painted the base. I took my kids outside to play a few times. I finally cleared all the clutter and passover boxes off the dining room table. I ordered some specialty fabrics I was supposed to get. I figured out what to give my little brother (29!) for his birthday. Haven’t bought it yet, though. Took R for her six month checkup, and got K started with a speech therapist. And every evening I sat down and said, “I just want to catch up on blogs and facebook, then I’ll write,” and subsequently realized that my brain was too fried to blog. And here we are. The challah is almost done and we’re off to Shabbat dinner at my parents’. I’m going offline again for Shabbat, so I suppose we’ll catch up either tomorrow night or on Sunday… I have so much to tell you! It’s been quite a week. Quite honestly, I had to force myself to sit down and blog. Not because I’m out of ideas, or because I don’t have time to sit at the computer – if I can get a score of 82,000 in online Tetris then surely I can scrape together fifteen minutes for a blog post – but because… actually, I don’t know why. It feels vaguely like a depressive symptom, but it could be exhaustion instead. You see, last week R decided to stop sleeping at night. I was up with her until 2 or 3 in the morning, three nights in a row. And yes, I still had to get up the next morning to take K to school. It was so bad that I actually started drinking coffee – the taste of which I still can’t stand – to get myself through the day in only a mild mental haze instead of the full-on fog in which I woke up. My friend asked her husband, an Orthodox rabbi, and a whole discussion of the situation ensued. The liberating upshot was that we are obligated to do our due diligence and check – visually – for chametz. If it’s smaller than an olive, it’s considered dust or dirt, but not chametz. And we’re not trying to get rid of dirt, we’re trying to get rid of chametz. Oh, and we have to get rid of chametz, but we can keep kitniyot (legumes) around even though we don’t eat them on Passover. Wild, right? 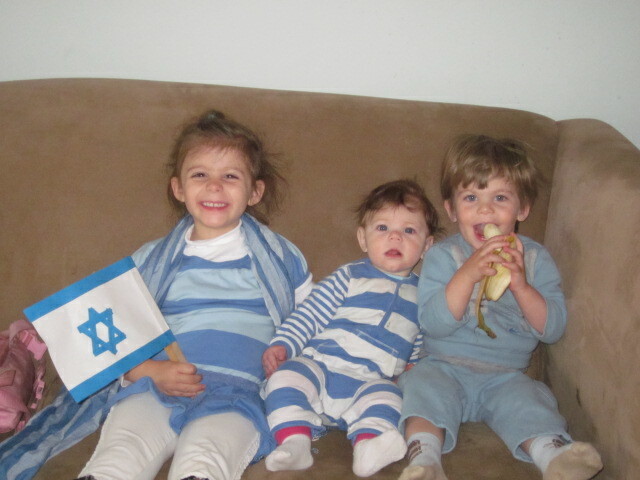 So the next day we pulled out the fridge and stove and checked for chametz under them; I checked the cabinets, removed chametz from the fridge, checked under the couch and behind the piano and in the playroom… and I was done. I did not scrub out all the cabinets. I did sand and oil the countertop, but that needed to be done anyhow and it felt vaguely therapeutic. So. Passover cleaning was completed. And how fitting that on the festival of our liberation, I was finally liberated from such a crushingly difficult tradition. Note to self: Matzo is not very filling. That’s why I can eat six or seven boards in one sitting. With butter. Also, don’t nosh on the candied almonds that Mum put out for the guests. Ten almonds are good – fifty are not better. Yeah, I gained 2.6 pounds this week. But last week I lost 2, so I’m still at 17 pounds lost overall. I’m sure when my eating habits go back to normal I’ll drop it again. Another fabulously liberating discovery: basting spray! 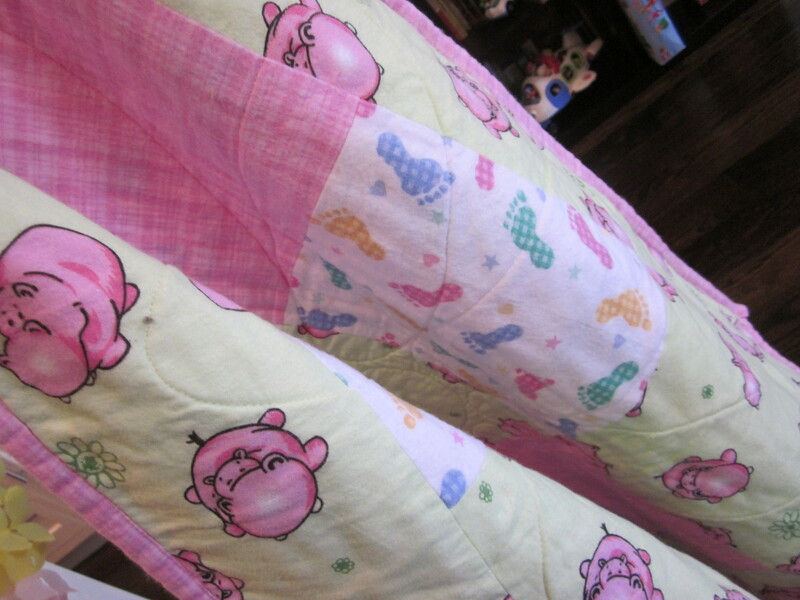 It keeps all the layers of the quilt together as I’m sewing, so that none of the fabric shifts or bunches. 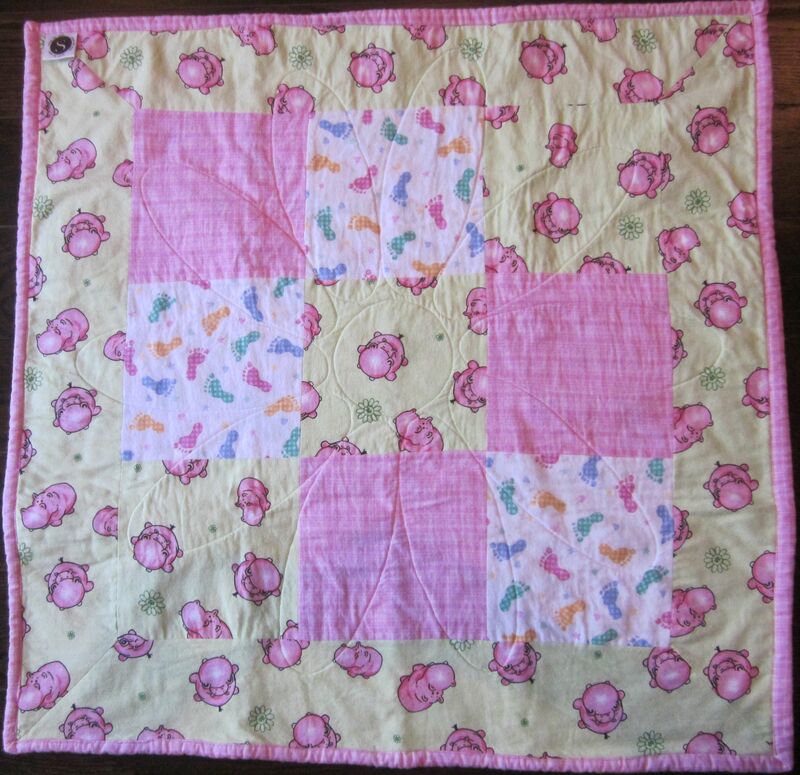 It saved me tons of time and stress and made the quilting process very easy. It’s a very simple design, but I love the flower shape that I quilted. See it? Doesn’t it look cozy? 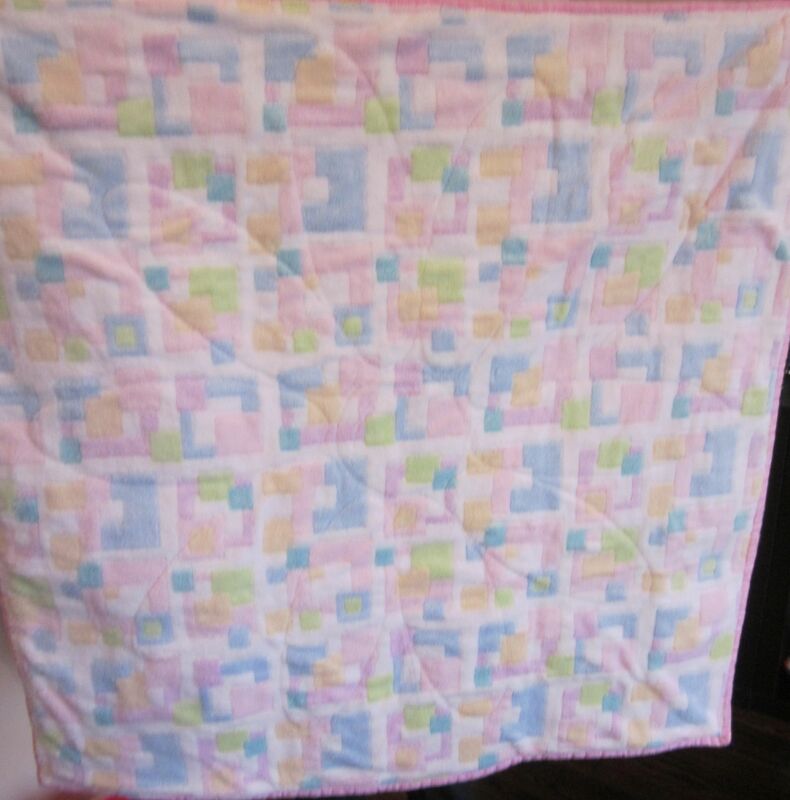 Just like with the last quilt I made, I seriously considered snuggling up with it and keeping it for myself. Alas, it was a gift, so I had to send it on its way. First, though, I attached a label. This time I printed directly onto a piece of satin ribbon, then used the iron to set the ink. After a few weeks of use, we concluded that the way I attached the table legs, while clever and useful, was not particularly stable. This week I plan to change that. If I get a chance, I’ll also start working on the stain/paint. At any rate, I need to finish this project because I’ve got quite a backlog and I don’t want it to get forgotten in the shuffle. It’s really a neat little table. I don’t have a nephew… yet. But apparently there’s one in the works, and I have until mid-May to make him a quilt. I’ve ordered some of the fabrics for it, but I really want to find something nice for the back. This week I’ll go to some fabric shops and suss out my options. … and that’s it. What are you up to this week? Okay, this is it: three more dinners until Passover. My cupboards are relatively bare, which means that we could probably squeak by for another week or two without buying any nonperishables. There’s just enough flour left for a pizza crust and some pancakes. There are two pitas in the fridge and we won’t replace them when they’re gone. I’m really winding down here, and it shows. Our dinners are just going to be weird this week. Since I plan to shop today and then not again until after Pesach, I’m also posting my menu plan for the week of Passover. It’s designed to use a minimum of special Passover foods, which are expensive and often unnecessary. Tuesday: my homemade kosher knock-off of Lipton noodles n sauce, made with remaining egg noodles. For the grownups, vegetarian “chili” – a can of black beans mixed with a jar of salsa, topped with tomatoes and grated cheese. Thursday: going out to eat, because by then everything will be cleaned for Passover and I don’t want crumbs. No time for chitchat today – I need to make my grocery list and then hit the supermarket before picking K up from school. I’ll take her with me to the butcher shop, though – they give her a lollipop every time. She’d hate to miss it. Still not sure what you’re making for dinner tonight? Check out Menu Plan Monday over at Organizing Junkie. First of all, I want to thank everyone who commented on my post about Shabbat observance. I haven’t had time to respond to comments this week, but every comment was read and appreciated. Keep the ideas coming! So, you may ask, in the wake of that post, how was Shabbat for me this week? I started off with the attitude that “Shabbat is our day of Yes.” All Friday afternoon I was running around cooking, quilting, cleaning, and generally trying to get absolutely everything done before Shabbat. As usual, my children were at my heels, begging for a scrap of attention. “Ima, will you read me this book?” “Ima, come watch our play!” “Book!” “Baff!” and so on. This time, though, instead of acting all frustrated with them, I told them, “I have to finish this work before Shabbat. As soon as Shabbat comes, I’m all yours.” This appeased them for 10 minutes at a time and got them very excited about Shabbat. We eventually lit the candles, and so began our “Day of Yes.” We sang and danced. We allowed the kids unlimited grape juice refills. K requested that I sing one Passover song after another, and I obliged her without so much as an “Ima needs to eat too, you know.” We had dessert. After the kids’ bedtime I sat down with a glass of wine and a book. R sat on my lap and played with my fingers as I read. The kids wanted to play “camping” and wanted me to watch – and I actually did. It was unexpectedly interesting. K was pretending to sleep in her “tent” (read: under the kiddie table) which involved her sucking her thumb with her eyes closed, and periodically peeking at me to make sure I was still watching. If it had been a TV pilot it would have been cancelled after the first broadcast, if it even made it that far. What it lacked in plot, character development, and acting skills, it made up for in opportunities to really look at my kid for the first time in a while. She’s beautiful, with delicate features and long eyelashes. I fell in love all over again. Mr. December took the “big kids” (laughable because really, N isn’t even two years old) to his parents’ house. R and I got ready to go to shul and eventually made it there – just in time for the kiddush lunch. I discovered something: Nobody cares if you show up at shul just in time for the food. They’re just glad that you’re there. I used to feel like if we didn’t get there by 10:30 or 11:00 there was no point; yesterday I arrived at 12:45 and spent over an hour chatting, singing, and praying (grace after meals) with my community. It was lovely. I took the subway up to the home of a friend who was having a baby shower (not a Jewish friend, obviously.) In my view, a party at someone’s home is the perfect Shabbat activity: food, folks, and fun, as the treyf fast-food giant’s commercials used to say. An afternoon spent with other women, wishing our friend well and sharing stories about our kids. The addition of cupcakes didn’t hurt either. 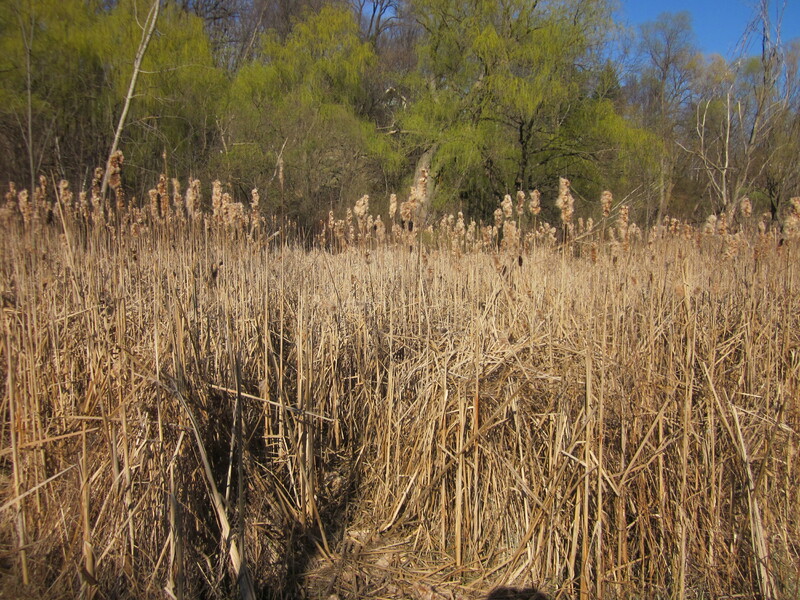 I walked home through the ravine, which took about 40 minutes… had to take care of those cupcake calories, so I walked pretty quickly. That was definitely out of tune with how I want to be on Shabbat: walking for the enjoyment of nature and to get somewhere in a relaxed manner? Great. Walking at a slightly uncomfortable pace in order to get my cardio in and burn extra calories? Not so Shabbos-y, in my opinion. I’ll remember that for next time. The other not-so Shabbos-y thing was that I used my cellphone to make arrangements for my brother to come over as soon as I got home. I really prefer the Shabbat “go with the flow” feeling where you drop in on people, or arrange a time in advance and recognize that timing is approximate. I felt like the cellphone was taking me away from the present moment and focusing me on future plans, and that didn’t sit well with me. And just like that, Shabbat was over. I walked through about twenty minutes of this on my way home. Hard to believe it's right in the middle of the city, isn't it? I need to bring the kids here this summer to play in the creek. 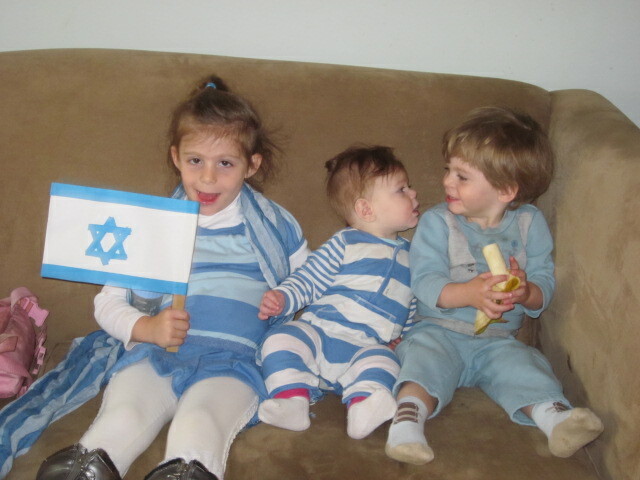 Things I’d do again: Dedicate lots of time on Shabbat to just being with my kids, however they want me. Go for a nice long walk. Visit with friends and family.